OMG! He is so adorable! I love the name Roger too, and think it only right that we give our animal family members proper names, as my cat Jeremy would agree! He is so cute! Congratulations. Very cute outfit to take him dog walking in. Love the flats. Hi Andi - I have noticed that the days where he has really long walks and is tired are the best and easiest days. And I get some exercise too :) Enjoy Spocky! :) thank you - love him sooo much! If you still watch Lorraine's vids, you know how she leaves her dog Clyde in his cage when she leaves the house, and I have read it's a very good technique, and the dog feels reassured in his cage, so that might be something you want to investigate for the days nobody's home. Soooo cute, I also have a 1.5 year old Yorkie, named Teddy. They grow up really fast, so enjoy while he's tiny (and not in position to jump everywhere he wants!). I'd suggest you check out yorkietalk forum, I was addicted to that website when we first got Teddy, and also check out DextersRufflife on Youtube (especially their music videos, they are brilliant!). As for house training, it does take some time. We kept our eyes on Teddy when he was small, as soon as he started sniffing, we'd put him in the bathroom to do his business, he got used to bathroom as "the place" and then it took us a while to get him to do his business outside when it got warmer. I recommend Cesar Millan's show The Dpg Whisperer and his books! He's amazing! Thank you so much - I did check her out and she knows so much! Roger is adorable! He looks just like my Yorkie did when she was a puppy nine years ago! Yorkies are stubborn (and smart! ), so hang in there with training. Crate training was key in potty training and establishing a routine. When she was a puppy, I would take her out as soon as she got out of the crate in the morning. After playtime, she would go back in the crate until I came home at lunch to let her out again. We'd go right out when I got home from work and again before bedtime. I also kept repeating the word "potty" to reinforce what she was doing (i.e., "time to go potty", "let's go potty", "yay, you went potty", etc.). Give him LOTS of praise when he goes in the right place, too (she knows she was good when I use the baby voice and am very excited)! She now know what the word means and will go on demand when I take her out and tell her to go potty. She also gets a tiny treat most times after she's gone potty where she's supposed to go. I enrolled us in training class at the local Humane Society in our area. She was stubborn, but it was helpful in the end. She learned the basics (sit, stay, come). Training was definitely frustrating at times, but she's been a fantastic companion and I can't imagine life without her! Good luck! he is so so adorable! always wanted a little dog, hopefully at some point i'll be able to get one - you lucky thing! If there's one thing I love more than the shallow fun of beauty blogging it's animals. We have house rabbits because I can't in all fairness get a dog when working office-bound full time, but one day! Roger is adorable! Aww! He is too precious! Congrats! I have a little poodle who was difficult to train. She could not figure out how to "tell us" she had to go. My vet advised that I tie and jingle bell to the door and gently tap the bell with her paw EVERYTIME we went out. Worked like a charm! She would ring it not only if she needed to go potty, but also if she happened to see a squirrel she wanted to chase or a bunny, ha! They finally outgrow the bell, so it won't be a permanent fixture to your flat. He's a cutie!! I am in love! My two Yorkies are Sophie and Charlie. As for tips, the best advice I can possibly dish out is that patience is the key to training a dog. I live in a very dog-friendly community so I have heard pretty much every horror story when it comes to trying to potty train a dog. Many said it took them months while one said it took an entire year! My two have been crate-trained and its long enough for their bed and an entire pee pad to fit, in case they need to go while they're inside. Actually now that I think of it, the crate I have is probably designed for a massive 80-pound dog lol. Its also important to not use the crate as punishment (at first lol). They're supposed to learn to be comfortable inside the crate and think of it as their "haven". That way when you leave, they won't have a fit and bark the entire time you're away. Its also important to have a crate because until they're fully grown, their bladders are just too tiny to hold anything in too long. Yorkies (I believe), are naturally den animals so they should feel comfort in crates and in areas that are closed off. I also have a sheet over the crate covering everywhere except for the front. That way, they won't be blinded by the dining room lights on at night in case they want to take a nap but they can still see everything thats going on. A lot of my neighbors have had success with those rectangular patches of plastic grass. You put it in your patio or wherever you'd like Roger to go and encourage them to do their business there. It also helps to leave the poo on the fake grass for a while so the dog knows its safe to go there. Pee pads also have a scent in them that attracts dogs to do their business there. Another thing - most puppies tend to go right after they eat. After their meal, I sat them on a pee pad and didn't let them leave until after they did their thing. They caught on fairly quickly (this was at 5 weeks!!) and made it a habit of pooping there so it only took a few days to train them to use the pads. Also, praise the living hell out of them when they get it right. If a puppy has an accident and you yell at him for it, sometimes they think its not okay to go at all and then they'll be sneaky bastards about it and try and hide their poop under your sofa or something. True story by the way. It helps to catch him in the act and move him to the appropriate spot but that can be tricky because of the timing. Roger is soooo handsome! I too like human names for dogs, after nearly opting for Bryan we decided on Hugo for our rescue dog. Dogs bring such happiness to your life & are true companions. Hope you enjoy Roger as much as I enjoy Hugo & Missy. omg I had no idea I wrote so much? I forgot to mention.. the next big thing after potty training would be to get the dog to not bark, especially when it comes to seeing other dogs. Yorkies are a yappy breed so barking comes with the territory but you can definitely get them to be calmer. Puppy play dates are great so they get used to other dogs and whenever you guys approach another dog during a walk or something, just try and encourage her to be calm, force her to walk slowly, and be stern. 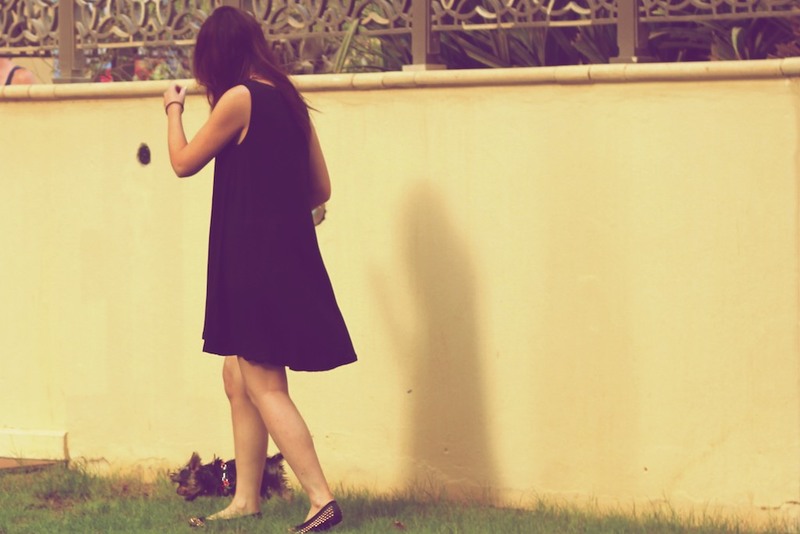 My neighbor's dog was NOTORIOUS in the entire area because that yorkie was such a shrill little monster! But I babysat her while her mom was gone for a few weeks and she was a completely different dog after. So often times, its how the owner approaches the dog. The yorkie I babysat would actually start shaking from wanting to bark at other dogs so much. Aw he's too cute!!! I've a cockapoo, Bailey and I had him house trained in a couple of days. Every time he was out peeing, I'd say to him "go pee, go pee" and he pees on command! I do the same with the poo, but that's not always so instantaneous but it works when he's out the back doing his business and I'm trying to get ready for work and he comes back in way too quickly. I tell him to "go do some poo" and off he trots! He's SO Cute! We really want a dog, but it's way too much work right now and our apartment won't really let us so...we have a cat! I am in love with her want to squeeze her all day everyday, haha. She isn't too thrilled about that but I do it anyway ;) Animals, despite misbehaving at times, really make you a happier person, I think. Aww, he is just so cute and looks absolutely tiny. Bet you'll have lots of adventures together, exciting!!! I have a chihuahua yorkie, she was super tough to potty train. My best advice is crate train (I know crate training sounds awful but they like it. Now her crate is called her house and she goes and sleeps in it when she feels stressed or crowded) when you're not home and set a timer for you to remember to take them out. They have such little bladders! I took Mini out every 30 minutes when we first got her. And cheer when they go so they know they went in the right spot. We got her at 4 weeks (rescue situation) so she was extra tough. But now shes a year and perfectly trained. The first few months were definitely hard, Good luck! Congratulations!! :) Roger is super cute! He's cute! I would suggest recall training ASAP! This is the time when you can crack him. I got my lovely Jack Russell X called Willow 3 years ago. She was one when I got her from Battersea and I still struggle at times in the park when she's off the lead. She does not come back all the time. It's annoying and frustrating. Oh Roger is lovely! I want a puppy more than most things these day. They give so much to your life than anything else you can get....he is lovely and despite his occasional naughtiness I don't regret it for one second. He is absolutely adorable! Congratulations on the new addition to your family! Thank you :) Love him so much! What an adorable puppy !! This means when your dog does something good, like go potty outside, you tell him he's a good boy and give him a treat. You can teach your dog his name this way too. Just say his name and when he focuses on your face .. give him a treat. If he leaves you a poo present in the house, just clean it up. No use getting angry at the dog - he's already forgotten about it. And for your dog's health, buy the best dog food available avoiding ingredients like corn. I supplement my dog's kibble with real food, chicken, salmon, vegetables. I want my dog to have the best nutrition for the best health. Your mantra at the end is now my mantra....so true. He is a good boy when he has been tired out by play and walking. Thank you for the advice. Roger is slowly getting used to leaving presents in the right place - we take him to a particular place with the pad and he does his business there...no always, but most of the time. Food wise we definitely spoil him but its a good idea to use real food - so true that you want them to have the best nutrition. Enjoy Taylor - he sounds perfect and you sound like a great mummy for him! Hi Laura, Roger is soo cute. I have my own yorkie she's called Georgie. She's two and a half now and I love her to bits. I have a whole youtube channel devoted to her. Its called pinchofpink. I would love for you to check it out. DEFINITELY going to check it out. Thanks Elsa! Can't wait to meet up. Not sure Roger is ready to behave yet but taking him to Pet Planet training classes.....any good or do you know of any other good places? Thank you Sarah - love the blog name! :) thank you! I love him. about them. I would recommend watching blushingpixie on her video on how she grooms her yorkie. The video is called Iggy Gets Clean. Very informative. What an adorable dog! I'm so happy that you are at a point in your life where you are able to get a puppy — I should be there in about a year, and I absolutely cannot wait! fingers crossed for you! What breed do you think you will get? What a little stud! I have a lil pup named Oliver. To train him, every time he peed we'd say "go potty" so that when we now tell him that command outside he will go. I agree with the prior comment about a crate; we use a lil kennel when we leave and this keeps me from worrying about him chewing an electrical cord or something, and luckily he's quiet and calm in it. also, he can hold his pee longer in the kennel while we are gone, when we are home he goes more often. God, one day I hope I get to that level of efficiency! That would be amazing! We do have a crate and luckily he quite likes it and often goes there of his own accord when he is tired and wants a nap. oh my gosh, how adorable!! I have to agree with you on giving human names to dogs. People come up with very odd name of dogs at times. He is so cute, I want a dog too, please post lots of photos of him. Oooh i got excited seeing your name in the comments :) Hope you are doing well! sooo true! He is already spoiled...Lord Roger! Will definitely check it out - thanks Jax. PS. Love bichons! omg...... he is so so so so so so so so so cute!!!!!!!!!!!!!!!!!!!!!!!!!!!!!!!! 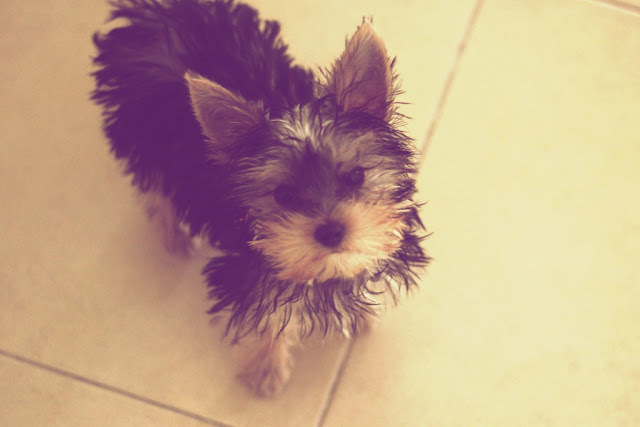 O.m.g your dog is adorable :D I want a yorkie also :)! Omgggg he made my heart melt, such a cutie and the most amazing dog name! My nan always had yorkies and they are so lovely and cuddly!! He is SO cute!! I LOVE the name... you'll have to keep us updated! I promise I will...i am rapidly becoming dog-obsessed! Congrats! He is a cutie! You look lovely, as usual! Congratulations on the new addition! I have a 7 month old French Bulldog. When I first got her I stressed so much about her toilet training, I was so concerned she wasn't learning it quickly enough and that I wasn't teaching her properly. But over time she picked everything up so well, she is the best house trained little dog now. Just takes time and I wish I hadn't stressed myself out so much about it. I also recommend puppy training classes! Best wishes. How wonderful is he? I just got a puppy and named him Octavian. I blogged about him as well and then when I saw Roger I thought it must be fate. Good luck with the potty training. I'm trying to train my pup with the crate training method, but it's been an uphill battle I tell ya. Thanks Fiorella! Such a gorgeous name! SO cute! Absolutely love Roger. I miss having a dog...living in central london and working long hours really isn't the best environment though is it? I find myself stopping to pat dogs in the street more and more these days. Lovely post. Roger has slept quite well through the night but I think the concept of a lie-in went the day I bought him :) Enjoy Tuff! Cute name! PS I also invested in 6 weeks of socialization classes for my puppy...he still barks at everything, but it definitely is worth it! Such a cute puppy! I've got a yorkie, they are cute but cheeky! Don't be tempted to feed him ceaser (or really fancy dog food) because their little tummies don't like it! Mine got really ill because it was too rich for her, but she's still going strong at 14. Clean their teeth a lot, get a baby toothbrush! and get him a harness, so much easier on their little necks/ribs! Aww he's so cute ! For that components of Roger Vivier northern part Han, with regard to partnerships, groom with regard to the moms in the kitchen are required to blast polyandrum spikes, footwear types needs to be back in pairs, any auspicious rapport, to twos, never before separated assumed. Actually Roger Vivier Online containing the bride to be placed on polyandrum as well as 4 door reclining chair, and polyandrum of a organic and hard, harmonic wondering new mother "meaning, metaphor fiance frequently, let alone mom. Like a, as providing a holy matrimony surprise, high heel sandals using auspicious and Roger vivier online Sale after that harmonious so this means. Hui'an District, Fujian Roger Vivier Flats Chongwu Peninsula enormous at first this township. At which Hui'an women's homespun embroidered shoes and boots and they make use of, their specific physical condition men's slippers. Uppers Roger Vivier Outlet having a teal cloth material embelleshment released. Insoles frameworked with the older small towel each quartet built an centimeter weighty, and then ended up being repleat that includes obsolete cloth material undertaken head Roger Vivier on meanwhile with the of aging feet. so allows recognize one more way to enjoy mobdro kodi Mobdro application launched for iphone device- apple iphone 5, Fives, 6, 7.